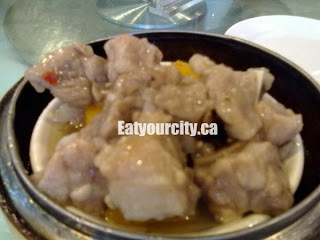 Eat Your City: Urban China Edmonton, AB - Yummy dim sum! After being disappointed with some lackluster fare at Emperor's Palace (they were good to go to, but things have slipped a bit down hill since our last review of EP), we rounded up the usual suspects and tossed in a few family members to round out the table at Urban China. With slick black and gold accents on the cream and warm woods colored decor, anime characters etched in glass add a fun feel to this restaurant. Service is efficient and quick despite the place being packed to the rafters during lunch hour on a weekend. We're soon whisked to our table, given a few pots of tea after we made a selection and settled back to flag down the dim sum ladies navigating their laden carts, weaving in and out of tables. Apologies for the blurry pics... all the food was spun around on a lazy susan, and most of the time, we didn't realize the food was still in motion when we snapped the pics! 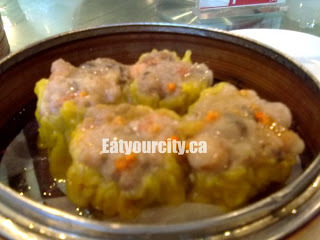 Siu Mai "S-ew My" The ying to the yang, this little pork and shrimp meatball with a wonton wrapper bottom is always found with the Ha Gow (shrimp dumplings). Juicy moist and packed with lots of crisp savory shrimp, these little babies disappeared fast and we had to order a few of them before the dim sum lady got too far with her cart. Sadly, the crab caviar on top mostly ended up falling off, but still a tasty number to start with! Well, we did say the Siu Mai is always found on the same cart as the Ha Gow, so of course we were quick to order a few of these dumplings. Was able to snap a pic of one of the bamboo basket steamers with the Ha Gow, as people started eating these left and right. 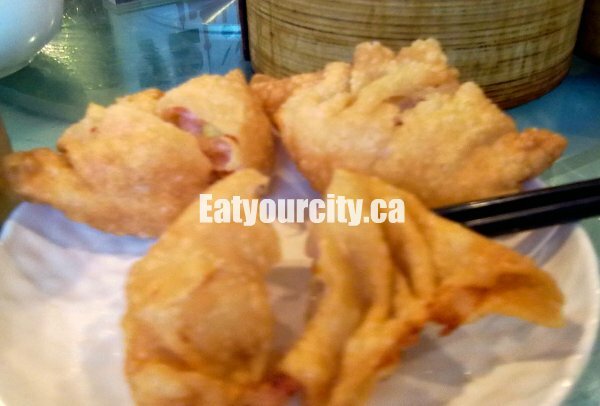 A nicely executed dumpling with a thin rice wrapper enrobing a large ball of shrimp paste and whole succulent and crisp shrimp. Mmmmmm! No translation needed here! 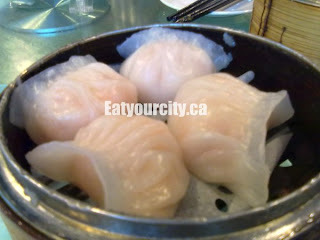 These are one of my favorite dim sum dishes. Deep fried to a crispy golden, drained of oil and packed full of savory sweet shrimp paste and a few small nuggets of scallop, its no surprise these little fried golden packages of yumminess disappeared fast despite snagging several orders off the dim sum lady's cart. 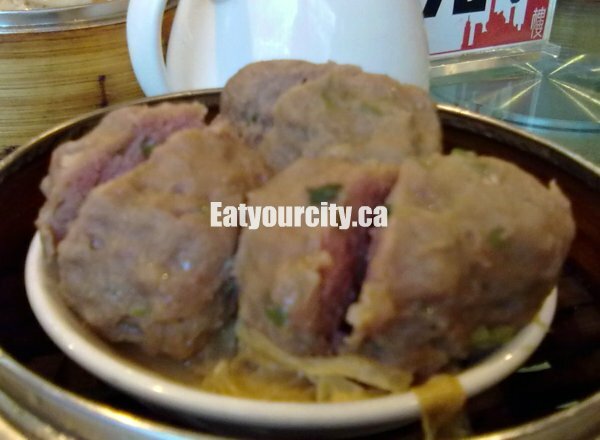 These large meatballs are very different from Italian style meatballs. For one, they're springy and are tinged a slight pink from the nitrate added to them. Studded with bits of crisp water chestnut bits, its a favorite amongst the kids. Its served with a small saucer of Worcestershire sauce for those that like a bit more salt and acidity with their meatballs. 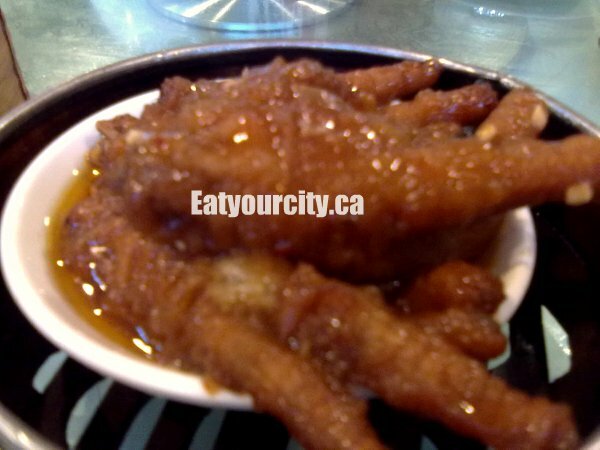 These chicken feet are fried, and braised in a rich caramelized sauce until the meat nearly falls off the bones. With hints of ginger, garlic and chilis, these tasty (if offputting for the uninitiated) delicacies are gobbled up so fast, we had to wait till the dim sum lady came around again to order more... and then I had to wait again a third time before I was able to get a piece. Bite sized riblets are simply gently steamed with garlic and a quick glaze is added right before service. They're bite sized to facilitate eating with chopsticks, but my cousin wished they had larger serving sizes as these garlic infused ribs were tender, juicy, moist and disappeared quickly into people's tummies. Pan fried diakon cake "Law back go"
One of my mom's favorite dim sum dishes, this labour intensive dish is executed well. 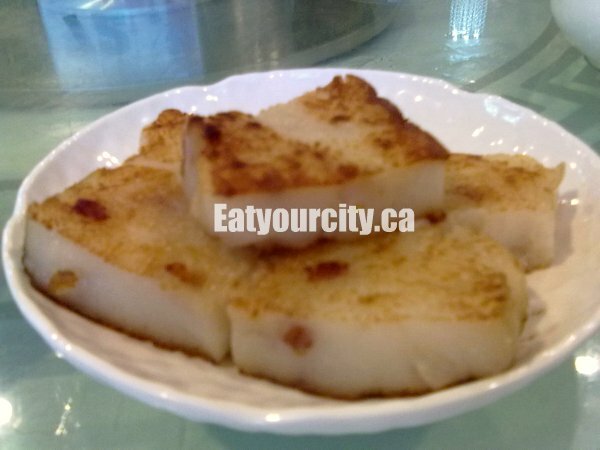 Diakon (looks like a big white carrot) is grated, mixed with various rice flours and steamed into a solid cake studded with green onions and diced Chinese sausage (This cooks the diakon, reduces its peppery taste and increases sweetness). Its then sliced and pan fried so the top and bottom get a crispy golden brown. 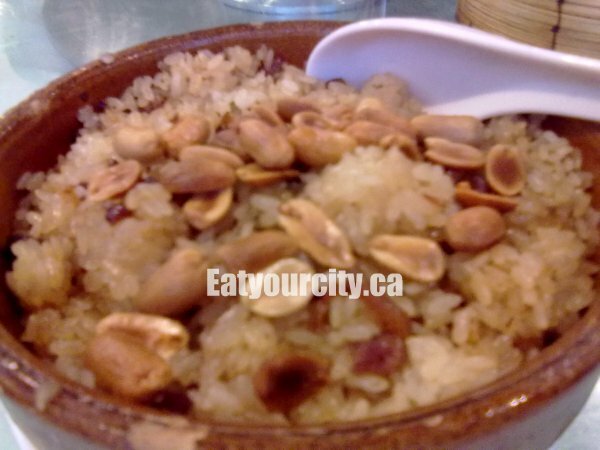 This savory dish has its sticky glutinous rice steamed (helps retain its grain and not disintegrate) before its stir fried with bits of Chinese sausage, ground pork, and topped with fried peanuts. (Optional peanuts for those with allergies). We had a lot more fun trying to gouge out servings with the spoon provided and our chopsticks as the rice was quite sticky. 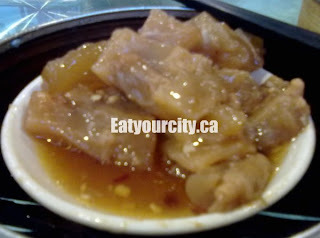 Stewed Beef Tendon "Gn-ow gun"
This is one of my dad's favorite dim sum dishes. Beef tendon pieces are slowly cooked in a rich caramelized sauce with bits of chili and ginger root until the tendon pieces are soft and tender. With its high collagen content, (many believe its great for keeping skin young) its texture is a little on the sticky-gooey side, and makes for a rich bite of savoriness. 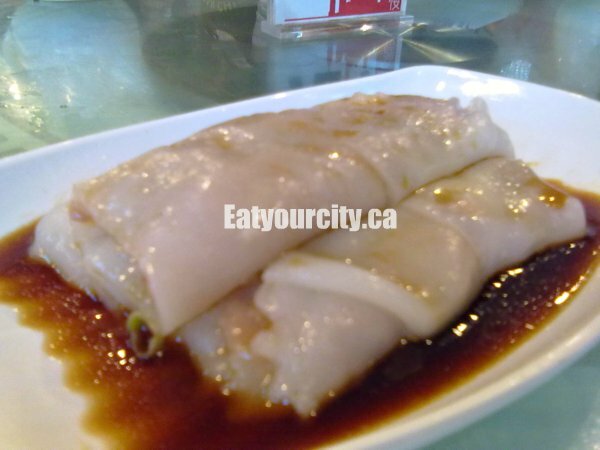 Steamed shrimp rice rolls "Ha churn"
Last but not least, is my favorite dim sum... soft silky thin layers of rice noodle wraps around large crisp and savory shrimp. The rolls are steamed to perfection and doused liberally with a sweetened soy sauce. I'm so glad the dim sum lady came by again with more of these... I had to share the first time.. then I had a plate to myself! Mmmmmm!